The best matches sometimes require a matchmaker. And so it was with the match between Santander Bank, N.A., and Southern Methodist University. 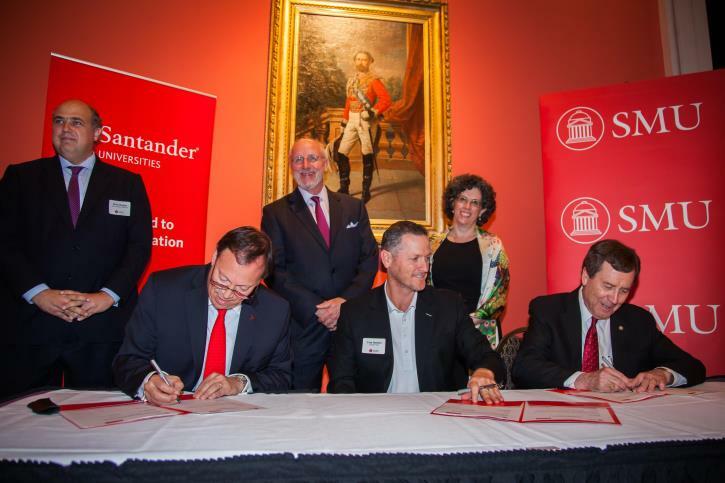 Santander Consumer USA played a pivotal role in helping SMU and the Boston-based bank make the connection that has resulted in a study-abroad opportunity for graduate-level SMU art history students in which the bank will provide scholarships to study in Spain or Latin America. Signing ceremony in Jones Great Hall at SMU’s Meadows Museum. Santander Bank, which is based in Boston, MA, and Santander Consumer USA both are business units of global banking giant Santander Group, which has a very strong worldwide universities program. The funding will support classes such as those taught by Dr. Beatriz Balanta which recently included a trip to Brazil to visit galleries, museums, art studios and artists gatherings. “Southern Methodist University is the optimal place for Santander to establish a universities program in Texas with its renowned art history program and the stunning Meadows Museum, which houses the most extensive collection of Spanish art outside of Spain, and its location in a city which is known for its culture of philanthropy and financial support for the arts. “Likewise, Santander has long valued the important role that art and creativity play in our collective history and culture. Indeed, the Santander global headquarters outside Madrid houses its own museum – The Santander Collection – with more than 1,000 works of art.